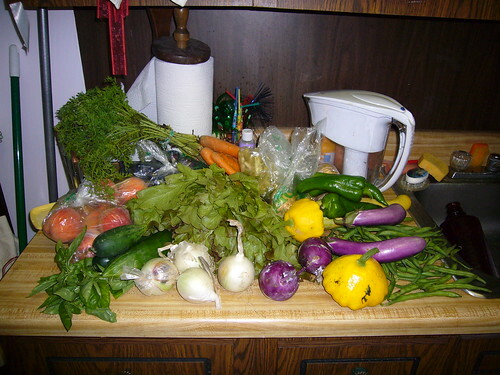 Community Supported Agriculture – general links and my weekly share blog (plus how I use it). We had gotten dill from our CSA a month or so ago, and it was sadly out of sync with the cucumbers – so I froze a few heads of the dill and used them in the pickles. It seemed to work just fine, I am not sure how they will turn out but I can’t wait to try them. Homemade pickles are, potentially, my favorite thing in the entire world. Potentially. Last night Mike and I had zucchini and corn fritters. Instead of grating we jullienned (any excuse to use our awesome OXO Mandoline – it’s super affordable and works so so well. It makes pickling things seem so much easier! ), and instead of scallion and cilantro we put in garlic and rosemary. 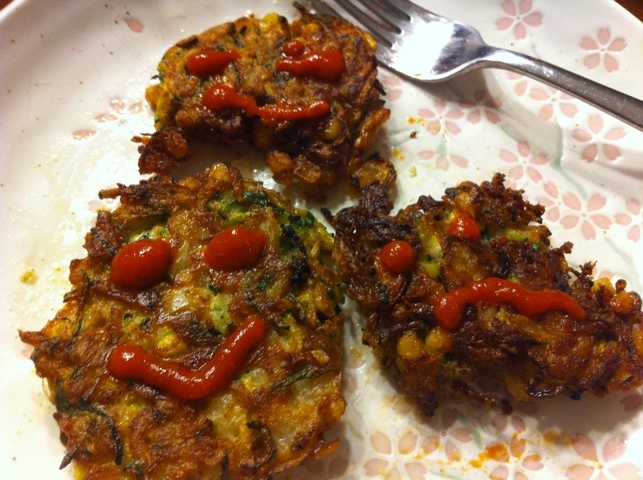 Shown with delicious sriracha sauce. I still have more pickling plans: green beans and cauliflower are next up, as is kohlrabi-in-lieu-of-radish. 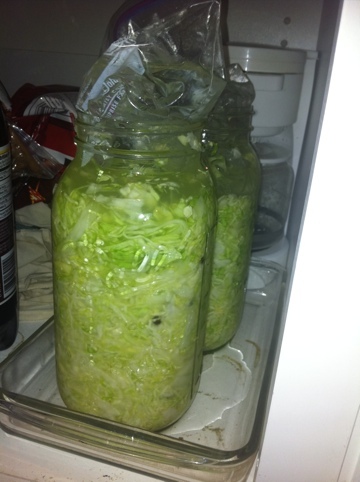 All I really need is 4 hours more every night and I’ll be totally caught up on my preserving. Started a gallon of sauerkraut tonight with Mike manning the mandoline and myself in charge of recipe reading, mixing, and packing. We used 1/2 gallon jars – the largest I could find at our local supermarket with canning supplies – and filled and stashed two jars under the cabinet. We weighted the cabbage with ziplock bags of brine, as suggested in The Joy if Pickling. If it gets too hot next week we will move it to the basement. This used two heads of cabbage, we have two more in the fridge. 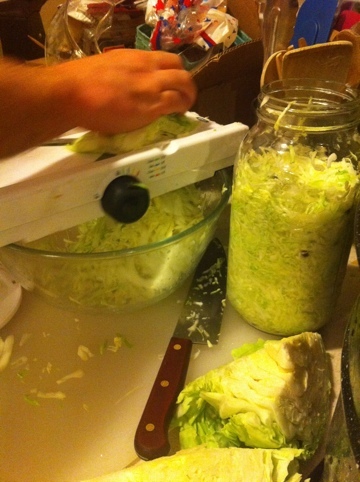 We will probably make kimchi with the rest in Sunday (no matter how non-traditional it is to use white cabbage). we got: lettuce (only 3 heads, it’s on it’s way out! ), yellow squash and zucchini, mondo cabbage, 8 (!!) 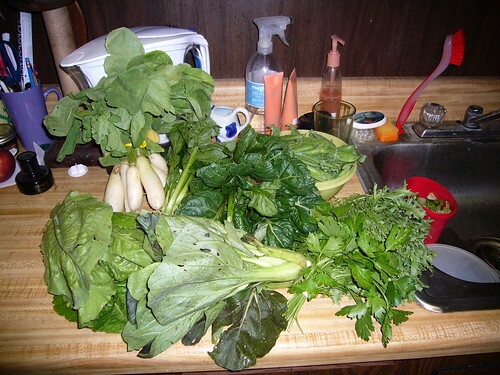 ears of corn, broccoli (a whole-lotta-broccoli), kohlrabi incl another giant head! beets, shelling peas, sugar snap peas. not shown a gorgeous bunch of basil. from last week we had leftover – a couple of zucchini, and a whole bunch of lettuce but we have plans to braise them all, if they’ve made it this far. And I made zucchini-chocolate-chip muffins. we have some sugar snap peas left over as well. I mean to steam some of these to toss into my salads but haven’t done it yet. On wednesday we had folks over for dinner and we ate all the corn, some of the broccoli, and all the basil in my favorite format – PESTO. and then we sent them home with half of the leftover broccoli. excellent! 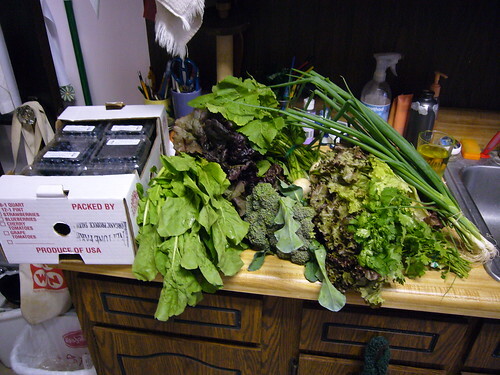 last week we sent them home with a bunch of lettuce, too. I’ve been making salads every day and putting kolhrabi and yellow squash in them, and then eating them with hummus. today I’m using zucchini b/c we’ve used up all the yellow squash. I love shelling peas boiled or steamed quickly and served with black pepper and chopped hard boiled egg. so simple and so delicious. lots and lots of lettuce, kohlrabi, broccoli, tomatoes (so delicious this week), shelling peas and sugar peas, yellow squash and zucchini. shelling peas, zucchini, kohlrabi. not bad! but seriously, though – what are we supposed to do with kohlrabi as big as my head? 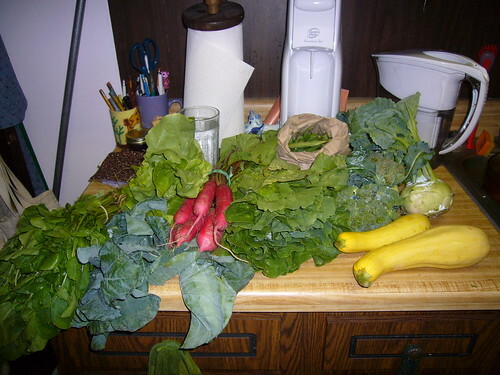 4 kohlrabi + leaves, sugar snap peas, shelling peas, tomatoes, a giant mass of swiss chard, beets + greens, dill, 4 heads of lettuce (two purpley oak leaf? and two more like romano). and ate the peas with hardboiled eggs. We quick-boiled all the chard at one time or another and enjoyed it in it’s chardy goodness, we avoided the kohlrabi, and we ate most of the snap peas. we had big big salads with lettuce and tomatoes. so yummy. 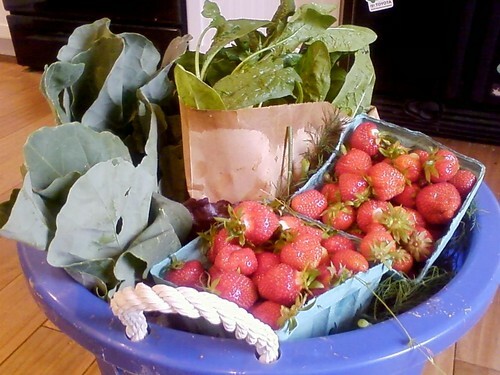 We have a new CSA this year! They’re right down the road, and I wrote about them here. AND they apologized for it being so small. YIKES! we are a little nervous. The strawberries – oh my lord, the strawberries. They are so magnificent. I can’t even explain how great they are. And the cucumber! the first cucumber of the season is so incredible – the fullness of flavor is so startling after winter grocery store cukes. two heads of lettuce (one red leaf and one oak leaf), swiss chard, cabbage, rainbow carrots (you can’t see the red one here), regular tomatoes and 1 heirloom tomato, cucumbers, jalepeno peppers, some cubanelle peppers, cilantro, eggplant, fingerling potatoes, green beans, patty pan squash, leeks, and ground cherries. no fruit share this week. Thank goodness! I have hardly touched the nectarines from last week. they’re just perfectly ripe now. tonight I plan on cooking a bunch of stuff, including potatoes, leeks, kohlrabi, tomatoes, eggplant, squash, corn fritters, and cubanelle peppers. phew! wk 8 cabbage, carrots, red onions, carrots, nectarines, zucchini. wk 9 basil, carrots, white onions, purple kohlrabi, zucchini, cucumbers, eggplants, and plums. wk 10 lettuce, yellow squash, cucumber, garlic, tomatoes, dill, dragon beans, green peppers, arugula, beets, apples and nectarines. 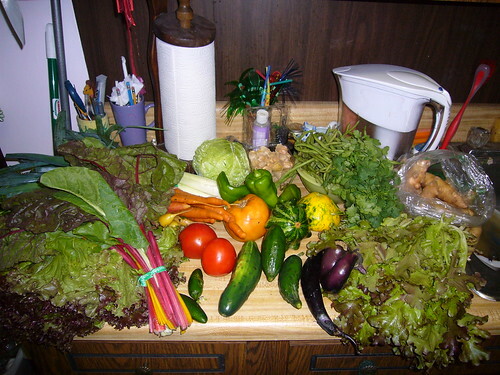 1 bunch and 1 head of lettuce, 2 yellow squash, 1 regular and 1 english cucumber, 2 heads garlic, 1 heirloom tomato, 2 regular tomatoes, dill, dragon beans, 5 ears corn, 2 green peppers, bunch arugula, beets, apples and nectarines. last night I used this recipe to make a plum “cake.” I think there is something wrong with the recipe, because it says to POUR the batter and I ended up patting it down like a giant slab of playdough. One of my friends had disasterous results with the cake, too. 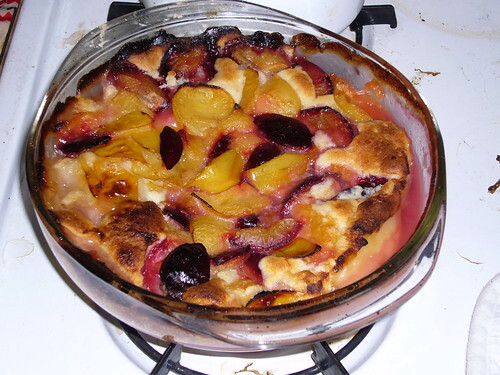 Mine came out pretty good, though it’s more of a plummy sweet bread than anything else.Â I’ve eaten a lot of the plums but it’s hard to stay on top of 2 lbs of stone fruit a week. and these plums are good, but I don’t know a lot of plummy recipes to use them up with. I still have a whole mess of beans to eat – green beans, 2 lbs of wax beans (though I thought there was more) and now dragon beans too. And I have to do something with the raddichio, though the stuff from wk 6 might be the worse for the wear. wk 5 onions, white turnips/radish, cilantro. 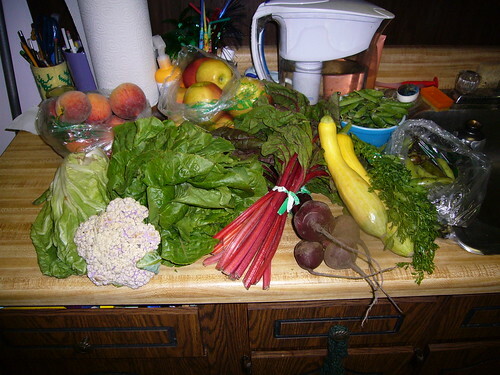 wk 8 raddichio, cabbage, carrots, small cukes, red onions, carrots, wax beans, nectarines and plums, zucchini. wk 9 basil, carrots, white onions, purple kohlrabi, zucchini, cucumbers, eggplants, green beans, and plums. things I may have to toss later: wk 6 lettuce, wk 6 raddichio, herbs from wks 1, 2, and 5. also fava beans? 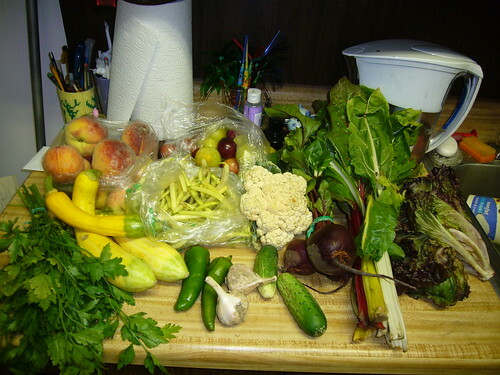 peaches, plums, wax beans, parsley, yellow squash, peppers, garlic, cucumbers, chard, lettuce, cauliflower, beets. I used the cauliflower from this week and the prior week with some of the garlic and created a delicious roasted cauliflower dish. it was So Good! I almost didn’t get this one, b/c I was singing the national anthem and forgot to call ahead to have my share bagged. Luckily the clean-up crew bagged an extra share that day! 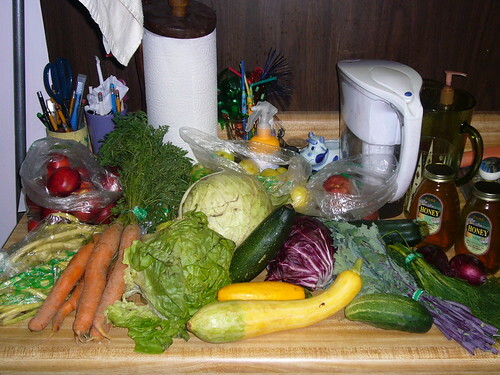 raddichio, cabbage, head of lettuce, carrots, yellow squash, small cukes, kale, dill, red onions, carrots, wax beans, nectarines and plums, zucchini, and potatoes. also purchased 2 lbs of honey from local source. the beekeeper has some hives set up in the backyard of our pick-up family! basil, carrots, oak leaf lettuce (so cool), white onions, purple kohlrabi, yellow squash, zucchini, cucumbers, eggplants, green beans, green cubanelle type peppers. peaches and plums. stir fry of cubanelle type peppers, onions, and patty pan squashes to serve over whole wheat pasta with parm cheese. surprisingly yum. 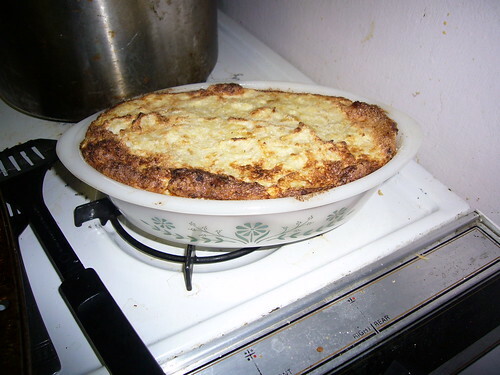 I’ve been eating the lettuce hot-salad style, with indian food or thai curries poured on top. it’s pretty good and an easy way to demolish 1/2 a head in a meal. I’ll do a status in the next post. raddichio, cauliflower, lettuce, swiss chard, beets (yay! ), yellow squash, cilantro, fava beans, and extra: english peas. I should have snagged extra garlic scape but didn’t think of it until the next day. also my first fruit share: peaches and apples. I let the peaches sit for a day out and they are so perfectly ripe now… and the most incredible sweet and juicy things ever. I shelled the peas (with 2 other weeks worth of peas) right away and I’m finishing them off right now with chopped hardboiled eggs for my 2nd breakfast. 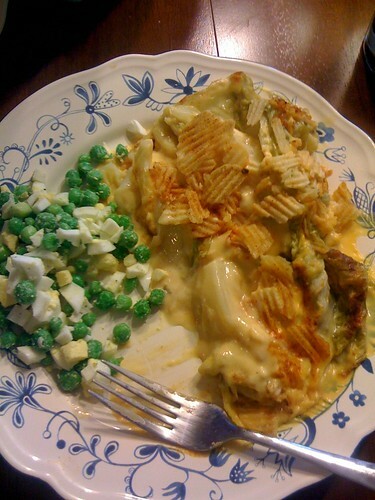 I that night I also made the epically wonderful cheese sauce of yore for the old broccoli. and I washed off all old lettuce and ate it for lunch yesterday. While I was washing greens I cooked the beets (just boiled) and I’ve got the 2nd half of them for my lunch today as well. wk 5 spinach, onions, white turnips/radish, cilantro. I can’t believe it, but I’m really catching up! amazing. the fruit share may make things a little harder. 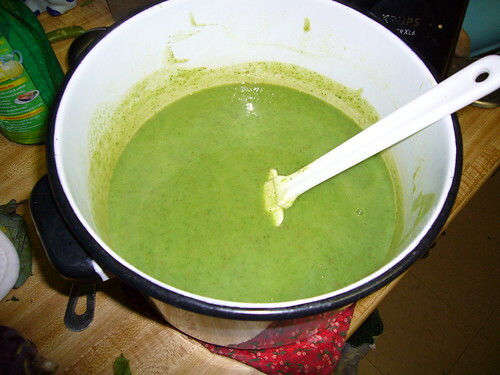 oh, and I didn’t finish my garlic scape soup (from, like, 2 weeks ago), so I have to chuck it. it smells… extra special. it LOOKS ok, but I don’t think I’d better risk it. Finally, up to date on CSA posts! pickup was tuesday the 10th – so I’m only 2 days behind. not too bad. 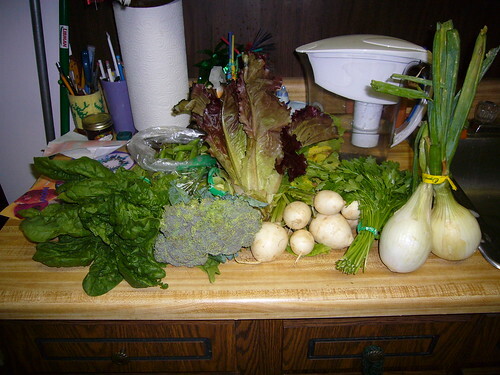 spinach, onions, 1 head lettuce, english peas, white turnips/radish, cilantro, broccoli. now, I have to admit – when I started putting this stuff away I was in the depths of despair. HOW could I be SO FAR BEHIND when I was only on week 4? and then today when I looked through the photos I realized that I am on week 5! which makes more sense! 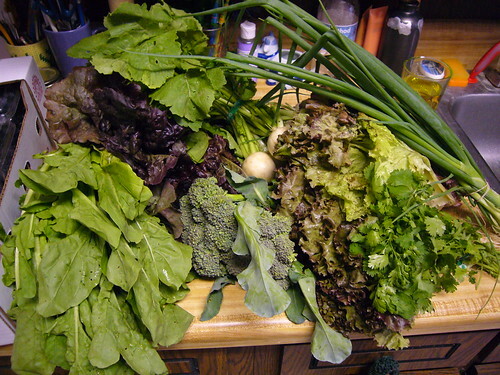 I sorted out all the old lettuce – I had heads in there from wks 2 and 3. THREE HEADS. so I washed and ate 2 1/2 heads of lettuce with trader joes green curry tuna on top. kind of a wilted lettuce salad. I had to toss the mizuna from wk 3. such an early failure! sigh. Today I ate the last of the blueberries – I gave away 4 pints but ate the other 8 pints myself (SO GOOD). 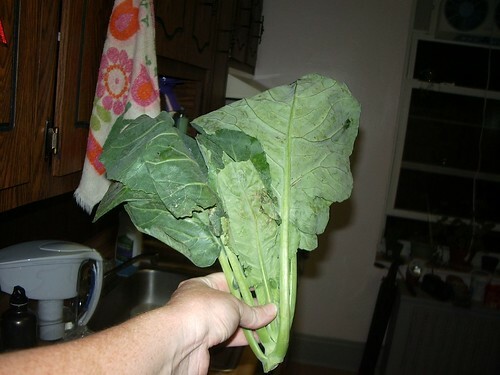 I plan to cook the broccoli and kohlrabi tonight. I need to figure out what to do with those turnips/radishes/whatever. I think they’re meant for eating raw, because they’re SALAD turnips. maybe if I grate them and mix with something salady? 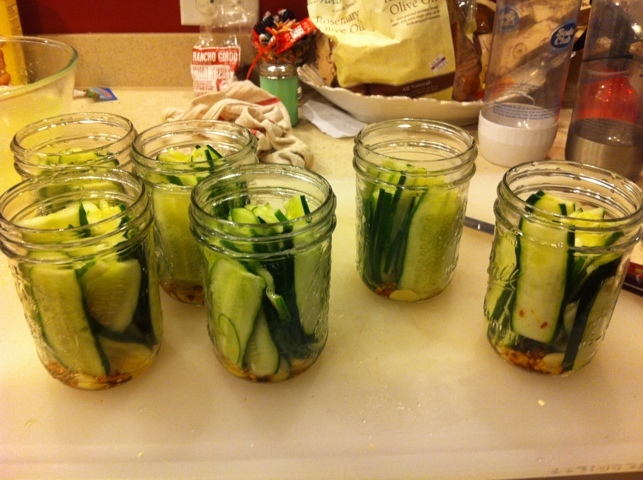 or maybe I could slice them thinly and dress with an acidic dressing… sort of salad pickle. I’ll fiddle around with them at home. Tonight I am going to cook all the broccoli and make a cheese sauce to eat it with. I love broccoli and cheese, and if that is wrong, then I sure don’t want to be right. Again, very poor records! pickup was 7/3. 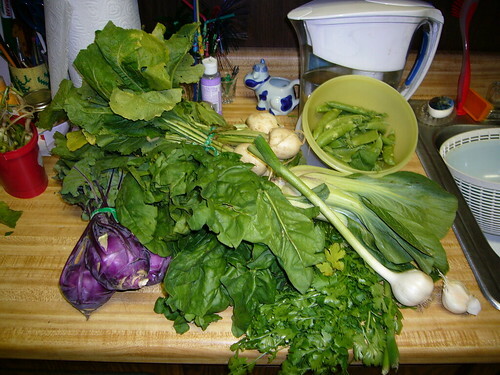 and included kohlrabi, cilantro, 2 heads of garlic, sugar snap peas, white turnips, spinach, and bok choi. my old standby: arugala wilted in garlic olive oil and tossed with toasted pine nuts and romano cheese over whole wheat pasta. so yummy. I ate a whole lot of it. thusly using up all the arugala from week 2.
it called for 24 garlic scape and all I had was 20, plus mine were a few weeks old, so it didn’t turn out as garlicy as I expected. it tasted like a green (good!) potato based soup. 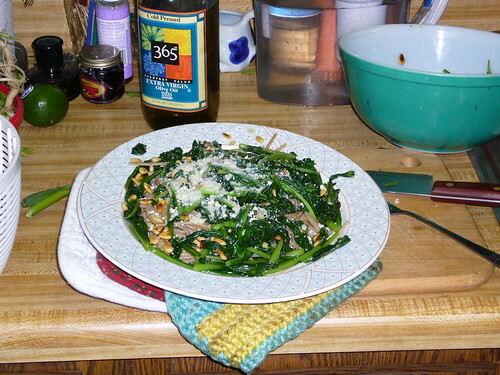 the green comes from spinach, by the way – and therein i used up the scape from wk 1 and the spinach from wk 4. 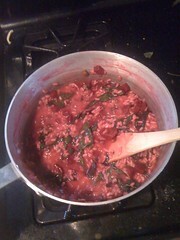 I saute in butter with splashes of soy sauce and eat over pasta or rice with nutritional yeast (or romano cheese). so tasty! this was made up for lunches over the week. again, I was so busy/tired/etc. from work/running/etc. that I didn’t post or make careful notations of the CSA. Wk 3 was picked up on 6/26 and was Very Exciting! most of all exciting was the ENTIRE FLAT OF BLUEBERRIES I had an opportunity to buy. it was $45 extra. TOTALLY WORTH IT. um. as far as I’m concerned. wk 1 20 garlic scape. wk 2 white radishes, bok choi, parsley, lettuce, frisee, and spinach. 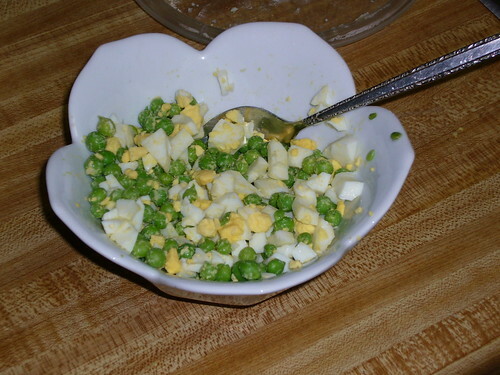 I did take the opportunity to shell and eat the english peas – I cooked them quickly in the microwave and tossed them with two chopped hard boiled eggs. it was SO INCREDIBLE. totally totally divine. Can’t even explain. and so quick and easy! During the week I also made and ate for dinner 3-avocado guacamole, using the green onions (which wilt pretty fast if you just toss them in your fridge, btw) and the cilantro. white radishes, bok choi, parsley, english peas, lettuce, frisee, and arugala. remaining from wk 1: one of the three heads of lettuce, garlic scape, and oregano. 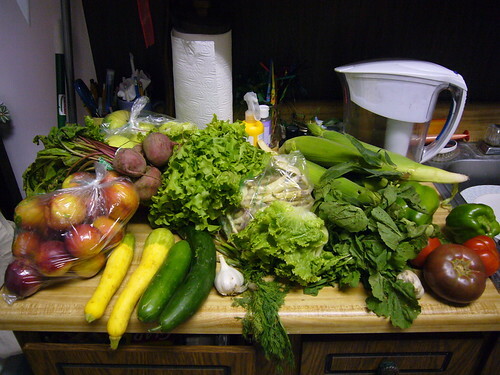 I didn’t mention this earlier, but I switched my CSA this year. Paramus was just too hard to get to after work, and also, there weren’t any community activities. I have a new pickup in Montclair and so far they’ve had (and I’ve missed) a farm day and a membership meeting. This CSA is more grass-roots organized, and that’s what I like. Last Tuesday was the first pickup! 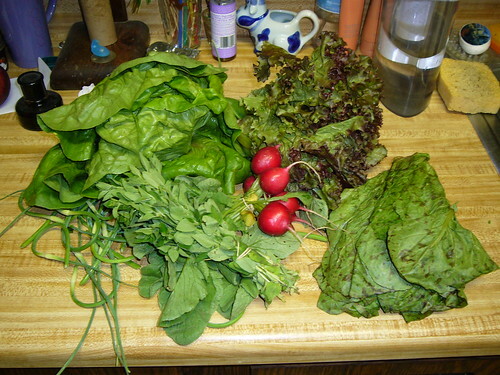 there were three kinds of lettuce, oregano, radishes, and garlic scape. 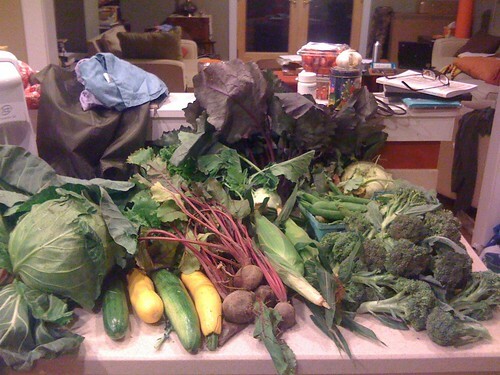 what a perfectly sized first CSA share! that said, I haven’t eaten a blame thing from it. I have been too busy at work and running around to actually wash lettuce. Sigh. Tomorrow is the second pickup and I’m behind all ready! 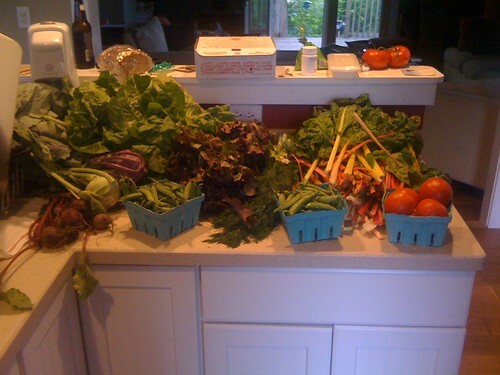 lest you think this will be all running, all the time, let me start by saying my first CSA pickup is today! yay! so look forward to photos and food and scramble to eat everything, starting tonight. and now back to running. ha! y’all know that I get kind of into stuff and totally obsess about it. the only difference here is that I actually HAVE to train, because I don’t want to embarrass myself in front of my co-workers. I mean, they handled the dance party and the arm wrestling ok, but will they handle the red face alright? or will they only be able to handle it if I am also a decent runner? what if I’m so slow everyone in the race finishes before me? I don’t want to be the last one. monday: 2 hard-boiled eggs, a cup of a salad made mostly from crabs, tuna, and shrimp, and then a can of herring in lemon and cracked pepper. tuesday: 2 hard-boiled eggs. and the day has just begun. hopefully by eating lots of protein I can avoid eating lots of crackers and ice cream like I usually do when I dive into a new exercise regimen! so, aren’t y’all so glad that my CSA starts this week so instead of blabbing about running and protein consumption I can instead blab about my fridge and how messy it is and how I need to clean it out and how I should have done it last night because tonight I’m getting my first shipment and shoot, there are still radishes in there or something from last season? boy I hope there’s lots of leafy greens. and not any green beans. I need to start slow, and green beans are always the hardest thing for me to eat. (un)sustainable agriculture, e.coli, western water rights, and local food. there is a whole lot that could be said about the e.coli thing. now that the spinach thing has gone from spinach to also lettuce, I was thinking about maybe saying something. Anyway, this whole situation falls neatly under several of the topics on the “things I feel strongly about” list, so I will try to restrain myself. Jesse over at Corduroy Orange has touched on some of the issues in a couple of posts, as well. maybe bullets will keep me on-track, ordered, and without too much fist raising prosteltizing. I found out that the strain of e.coli that is responsible for the spinach sickness and deaths is a strain that can withstand high-acid conditions. incidentally, when you factory farm cows you create high acid conditions in their stomachs. cows don’t really eat grain alone very happily – it creates something called “feedlot bloat” which creates excess gas that inflates in the cows rumen and which can press on the cows lungs and suffocate them. this is one of the reasons why it’s GOOD that feedlot cows are slaughtered within a year. The grain also makes a high acid condition in the stomachs, which makes for some happy special evil strain of e.coli. the map that jesse posted says this very clearly, but it’s amazing that we are relying on the salinas valley in california for the majority of our produce. not only is this ridiculous, it’s unsustainable for a number of reasons: 1. we shouldn’t have all of our food eggs in one basket, so to speak. 2. fuel costs have been, until recently, going up superfast. 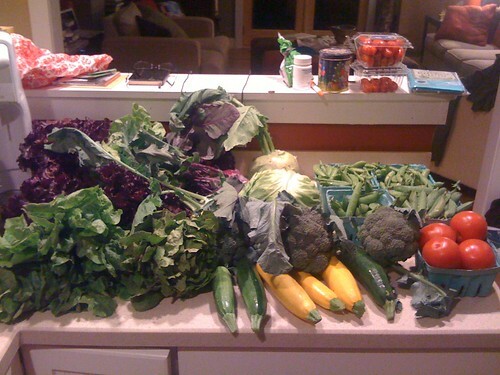 these costs weren’t embedded in the cost of our cheap california produce, but they will be sometime! 3. I hear that the northern groundwater wells (primary source of irrigation for the salinas valley) are experiencing saline intrusion. which means, you know, that we’ve got all these eggs in a basket but it turns out the basket is really just a really big hourglass full of sand, and the sand is dropping out of the bottom of the glass, and the some day the eggs will come shooting out as well. if you haven’t read cadillac desert, you really should. the water rights issues in the west will only become more important as time goes by. and now that farmers are learning that they have to pay attention to the run-off from factory farms I can only see some complicated negotiations in the future. I think there should be a serious dialog about the cost of food in america. and while we’re talking, we might want to look into the ENVIRONMENTAL cost of food in america. I’m not just talking about food miles here, but also the unsustainability of an economy that always comes down to a dependance on oil – usually in the form of petrochemical fertilizers. I also think there should be a serious dialog about homeland security. 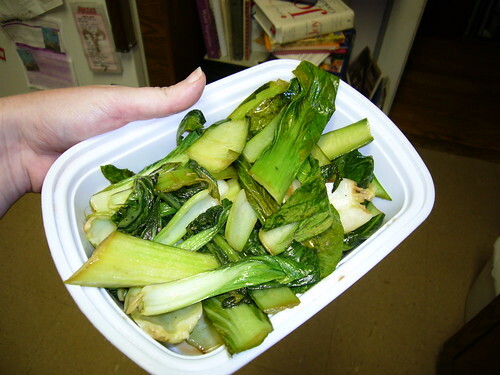 The spinach situation reminds me a lot of the green onion hepatitis A outbreak when I lived in pittsburgh. we can’t just keep getting all this cheap food from around the world without dealing with the social and environmental consequences. who’s picking your food? are they being paid enough to live well? to be hygenic? to treat their own illnesses or to take time off of work when they’re contagious? if these aren’t issues of homeland security, I don’t know what is. Anyway! not too bad, no? just a quick hop onto the ol’ soap box! 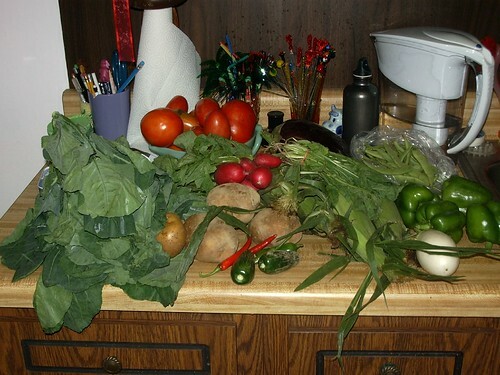 so as not to just wave my hands around without offering any real solutions, how about CSAs? they say the personal is the political, and I see food as an extremely political issue. and with any issue, you have to decide where to start and start slowly. you can’t let the scope of the issue overwhelm you into non-action. I’ve decided to start by eating meat infrequently, trying to eat organic and grass-fed where I can, and by purchasing as much local and/or organic food as I can find and afford. 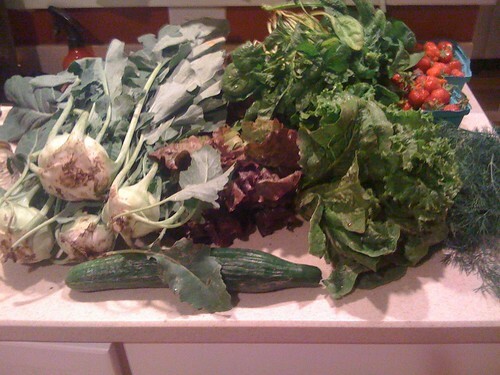 I was on vacation last wednesday so I didn’t get a csa share. While I do wonder what I missed, it’s ok sometimes to not get a zillion veggies every wednesday. I’ll get by. mystery cabbagey food, (so! many!) tomatoes, potatoes, hot peppers, corn, water cress, green peppers, purple and white eggplant, beans, radishes. which tastes like cabbage if I eat it raw. any idea what it is? week 9: cubanelle peppers, potatoes, kohlrabi stems? I’d made the eggplant from week 8 and 10 and 11 into baba ganoush for the beach, and took with me the corn and tomatoes. I’m embarrassed to say that I have no idea how the radish and peppers from previous weeks are doing. I need to check that out. the cabbage I have plans for an egg noodle gulash sounding dish that should be really good with some brats. 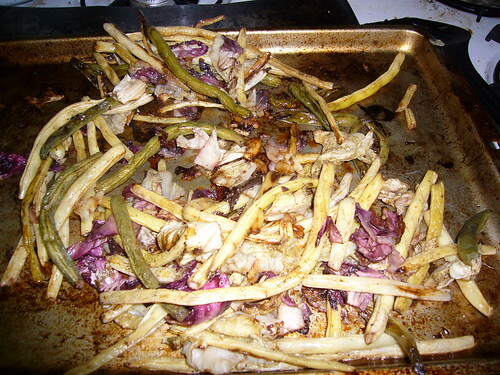 I had to pitch some potatoes b/c they’d rotted (weird!) 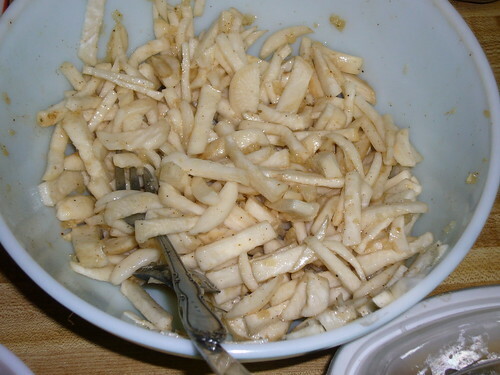 and I am thinking that the kohlrabi stems are more of the mystery cabbage flavored food that I got so much of this week. I’d like to say that I’ll spend sunday evening cooking like crazy, but then, I don’t want to make any bets. we’ll see what happens. if I did, I’d make that cabbage thing, an eggplant dish to properly display the pretty white eggplant, and some of that tasty spicy cubanelle-feta spread. maybe a cornbread with real corn in it and some jalepenos. and DEFINITELY something with those beans. man! I have 2 bags, and I tossed another one this week. 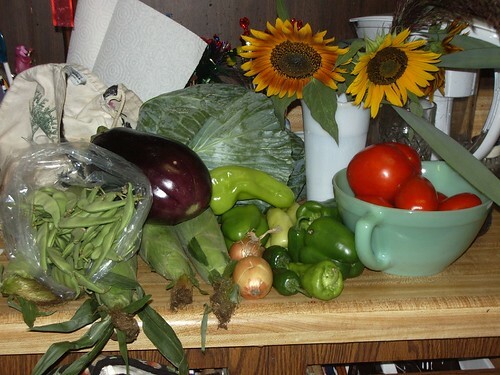 corn, beans, eggplant, tomatoes, cubanelle peppers, green peppers, hot peppers, shallots?, cabbage, sunflowers! and I just ate all my cabbage! and now I have more! crap! week 9: cubanelle peppers, white and purple eggplant, potatoes, kohlrabi stems? I had to toss the beans from weeks 6 and 7. And I didn’t use all the mint, but I did use some. 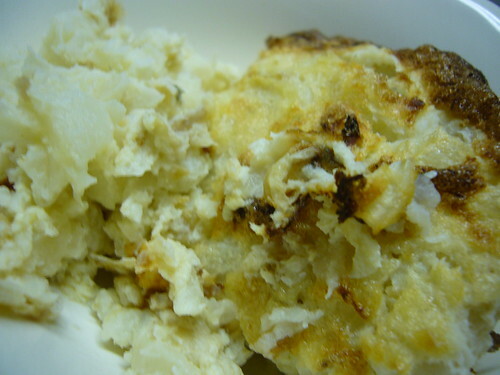 I am going camping next week so I’ll try to do that feta/cubanelle pepper spread again, and will make baba ganoush, and might do something with the cabbage. or might not, that stuff will keep! and I’ll bring all my tomatoes with me (at kelly’s request), as well as all radishes and green peppers. and then I’ll only have a little bit of stuff left!